Dan Cooper in action at last year's Ulster Grand Prix in the Supertwin class. 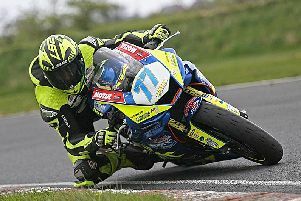 Stroud’s Dan Cooper will make his debut at the 95th KDM Hire Cookstown 100 at the end of this month. The announcement was made at the official press launch of the event at the Royal Hotel in Cookstown on Thursday evening. There remains a possibility that Michael Dunlop could make his roads bow on the Bennetts Suzuki at the 2.1-mile Orritor course from April 28-29, where Guy Martin is already confirmed as a definite starter on his new Honda Racing Fireblade SP2 Superstock machine. English rider Cooper tasted international success last year at the Ulster Grand Prix, where he won a thrilling Supertwin race at Dundrod. He is due to ride in the Supersport, Supertwin and Cookstown 100 feature races. The 30-year-old was unavoidably caught up in Ryan Farquhar’s crash in the Supertwin race at the North West 200 last May and was lucky to escape serious injury. Now back to full fitness, Cooper will ride the KW Electrical Services Kawasaki ER6 in the Supertwin class this year and a 600cc Honda with backing from Ruby Site Services, with both machines running under the Dan Cooper Racing banner. The Cookstown newcomer has already completed a number of laps around the Orritor course in Co Tyrone and Cooper is looking forward to taking his place on the grid at the end of the month. Cooper’s entry adds extra quality to the packed grids for the second Irish National road race of the season, joining Lincolnshire star Martin, who is making his return to the event after sitting out all of last season. Last year’s double Superbike winner, Derek Sheils, will be out for a repeat on John Burrows’ Cookstown B.E. Racing Suzuki, while Derek McGee, McAdoo Racing’s James Cowton, Michael Sweeney and newcomer Alistair Kirk – both BMW-mounted – are also entered. Last year’s man of the meeting, Paul Jordan, will ride the ex-Tarran Mackenzie Kawasaki in the Supersport class plus a Kawasaki Supertwin in the B&W Site Sealants colours, while Adam McLean will be out on his MSS Kawasaki ZX-6R, Kawasaki Supertwin and the Roy Hanna 125cc Honda. Both Jordan and McLean will make their debuts at the Isle of Man TT in June. The Cookstown Club is appealing to fans to support Irish road racing by purchasing an official programme and making a voluntary donation at the entry points to the course. Roads close for practice on Friday, April 28 from 12 noon and on Saturday, April 29 from 10am for an 18-race programme. Three races are also scheduled during practice day on the Friday, including non-championship Supersport and Open races.